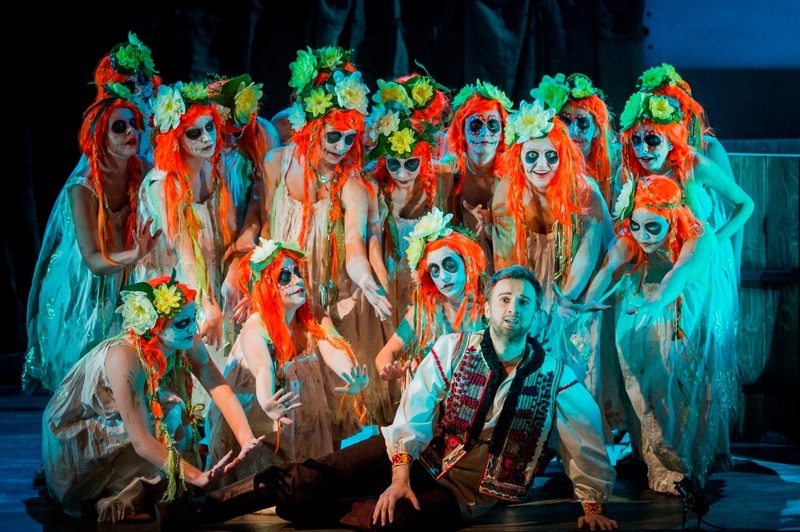 We don't see enough Rimsky-Korsakov operas in the UK. He wrote fifteen of which only the last, The Golden Cockerel is anything approaching a regular if infrequent visitor (I have managed to accumulate a total of six of them in my forty year opera going career). 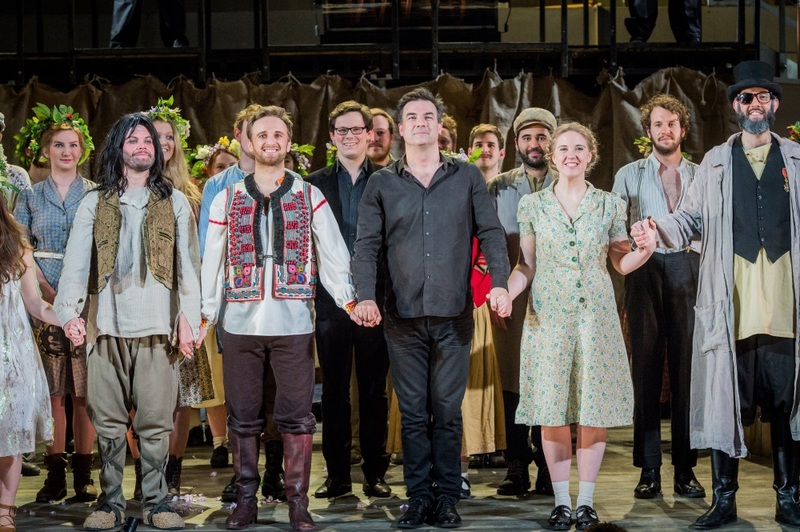 It was welcome indeed to catch his second opera May Night (dating from 1880) performed by Royal Academy Opera at Ambika P3 on Friday 11 March 2016. 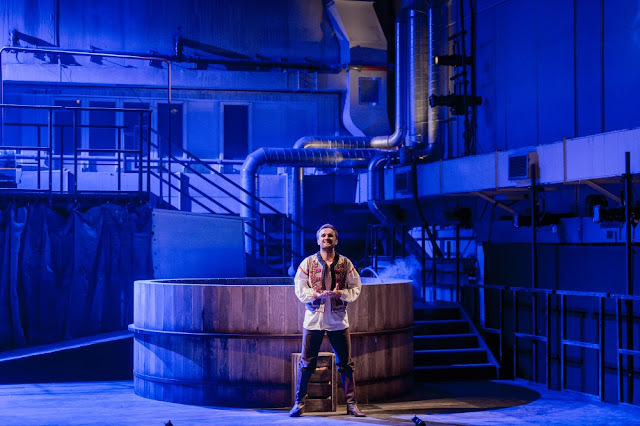 We caught the alternative cast, with Mikhail Shepelenko as Levko, Emma Stannard as Ganna, Phil Wilcox as Kalenik, Timothy Murphy as the Headman, Claire Barnett-Jones as the Headman's sister-in-law, Martins Smaukstelis as the Distiller, Lorena Paz Nieto as Pannochka and Henry Neill as the Clerk. The production was directed by Christopher Cowell, choreographed by Mandy Demetriou, designed by Bridget Kimak, with lighting by Jake Wiltshire. Gareth Hancock, the new director of Royal Academy Opera, conducted the Royal Academy Sinfonia. Ambika P3 is not a theatre, it is a huge semi-industrial space that was a former testing lab at the University of Westminster, and is now used as an arts venue. For the opera, Royal Academy Opera along with a team from Rose Bruford College had to build the whole technical infrastructure of a theatre. The space does not lend itself easily to such use, the flow of audience to and from the theatre and the toilets, got confused with performers moving from the theatre to their backstage areas. And performing such a large-scale piece with so many performers certainly put pressure on resources. But it was well worth it, the space is highly atmospheric and enabled Royal Academy Opera to perform a piece which would not fit into their existing opera theatre (which is currently being re-built). Over 40 singers were accompanied by an orchestra of 55 (including piano and two harps), and an off-stage band of 13. 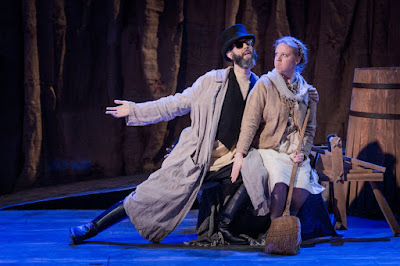 Rimsky-Korsakov's opera is based on a tale by Gogol and set in a village in the Ukraine, far from authority, where the say of the Headman (Timothy Murphy) goes. In the original, the old manor house is to be pulled down and replaced by a distillery, hence the visit of the Distiller (Martins Smaukstelis). Christopher Cowell and Bridget Kimak updated the period to the 20th century, post-revolution and the setting was the old distillery which is to be pulled down and updated by the Distiller. This enabled the many large-scale village scenes to take place amongst the striking semi-industrial set (which matched the venue) and removed the cutesy element which can be fatal to Rimsky-Korsakov's operas. He was fond of stories which put Russian life under the microscope. Often discursive in structure, and embedded in the semi-pagan rituals which were still common in the 19th century. May Night is centred on the fertility rituals associated with Rusalkas (spirits of unclean dead, unbaptised childen suicides, which live in water). 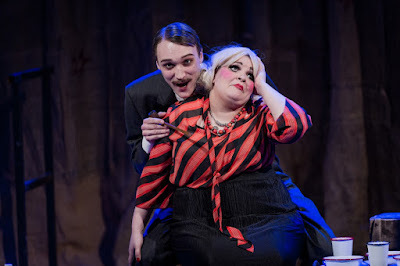 The first act introduced us to the young lovers Levko (Mikhail Shepelenko) and Ganna (Emma Stannard). He is the son of the Headman, who refuses to countenance their marriage. Levko discovers why, his father is keen on Ganna himself; Levko vows revenge. We also encountered the village drunk, Kalenik who, on his way home, is persuaded by the villagers that the Headman's house is his own. Act Two takes place in the Headman's house. He and his sister-in-law (Claire Barnett-Jones) entertain the Distiller, with the sister-in-law making a play for the man. They are joined by the clerk (Henry Neill) who is one of the few people who can read. But they are disturbed by Kalenik, by the throwing of stones and by rowdy, rude songs mocking the Headman and in the chaos the sister-in-law is locked into the cellar by accident. Act Three sees a depressed Levko singing to the moon. The Rusalkas appear. We have already heard the tale about one of them, Pannochka (Lorena Paz Nieto) who is upset that her former stepmother, a witch, has hidden herself amongst the Rusalkas. They play the Raven game and this enables Levko to spot the witch. In gratitude the Rusalkas give Levko a letter, this is from the commissar of the village who authorises Levko and Ganna's marriage. The opera concludes with celebrations and the final fertility rituals. There is much telling of tales, and village ritual in the opera and Christopher Cowell and his young cast brought it too teeming life. There were no dancers, the young singers did all the choreography whether it was the dances for the Rusalkas by the women, or the men's lively Russian capers. All great fun and very impressive. 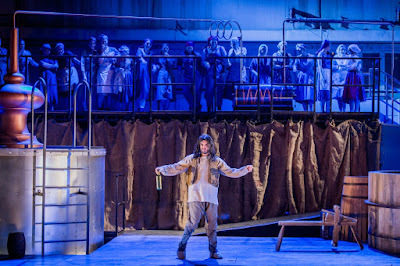 It was the great sweep of these communal scenes which really brought the opera to life, and both Cowell and conductor Gareth Hancock gave the score a lively sense of impetus and movement. Rimsky-Korsakov's orchestration was as full of life as the stage, whether it was the use of an off-stage band, the section with a village fiddler-like solo violin, or the addition of piano to the texture (the programme book had a striking photo of the piano being craned into the space). Though individual arias, like Levko's song, were memorable I did rather find that the solo and recitative like passages were less than memorable. You felt that Rimsky-Korsakov's music for the comic dialogues needed a little more point and a more sarcastic edge. But the young singers did their utmost to bring it to life and Cowell's production was highly physical. The Headman is one of those characters familiar from Rossini, a vicious yet comic villain. Murphy used his height to great physical effect and created a little portrait of a pompous autocrat, with an inflated sense of his own ego, and very funny too. Mikhail Shepelenko and Emma Stannard were a complete delight as the two young lovers, Levko and Ganna, especially in their long scene in Act One. Stannard had little to do in the remaining acts, which was a shame because she really charmed. Shepelenko had a lovely lyric tenor voice and appealing personality. Without a deep pit to cover te orchestral sound, his voice did not quite have the heft required to always get over the orchestra but he always sang with appealing personality. His Act Three song to the moon was one of the highlights, lyrically beautiful and accompanied by the stunning combination of two harps and a piano. The Act Two scene with Murphy's Headman, Martins Smaukstelis's Distiller, Claire Barnett-Jones's sister-in-law and Henry Neill's clerk was a complete comic delight. One long sustained sequence where the four singers each created a strong sense of comedy, both aural and visual from Smaukstelis's supercilious man of the world (complete with pipe), through Barnett-Jones's completely over the top femme-fatale act to Neill's precise pomposity. In the last act, Loren Paz Nieto made a highly touching Pannochka. Phil Wilcox was the drunken Kalenik, a sort of running gag throughout the opera. The piece was sung in what sounded like creditable Russian (Mikhail Shepelenko is a native Russian speaker). This was a performance which you came out of with a smile on your face. Cowell's production and the enthusiasm of his young performers brought out the sheer teeming life and joy of this piece.